One of my mom’s most treasured pieces of jewelry is her mother’s ring. She has two, one for me/Greg/my brother and another for her grands. Both are stunning, so when US Family Guide asked if I’d be interested in working with Mama’s Jewelry to share their collection of mothers rings, I just had to say yes. Over the next few weeks, I’ll be picking out the design for my mother’s ring (with stones for October, December, and two Aprils). I am so excited! They typically send out your personalized item within 3-5 days then shipping takes about a week. Mother’s Day Special Offer – Save $10 Off already low prices. 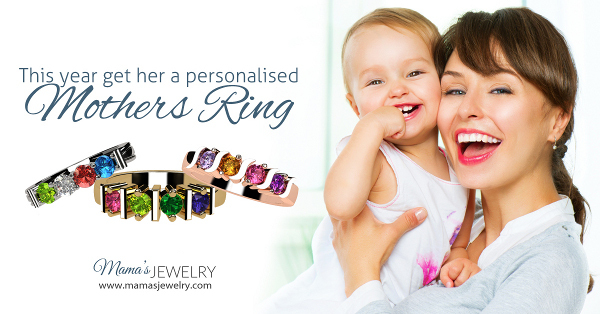 (minimum purchase $59) @MamasJewelry has been designing rings for moms for 30 years committed to creating exceptional mothers pendants, rings, and earrings at affordable prices. This entry was posted in Holiday Gift Ideas. Bookmark the permalink.